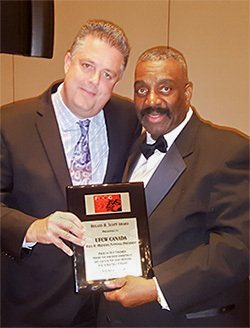 (l-r) Barry Sawyer, UFCW Canada Executive Assistant to the National President with Donald L. Cash, Sr., President of the UFCW Minority Coalition. Washington, D.C. – November 22, 2016 – UFCW Canada was recently honoured for its work in combating and raising awareness of sickle cell anemia at the 18th Annual UFCW Minority Coalition Awards Dinner, held in Washington, D.C. on November 19. Hundreds of union and human rights activists from across the United States and Canada attended the annual dinner, where UFCW International Secretary Treasurer Esther Lopez was honoured by the Minority Coalition as Person of the Year. The Minority Coalition presented UFCW Canada with the Roland B. Scott Award, named after the renowned doctor who served as a leading researcher and driving force in establishing treatments for sickle cell anemia. The award was presented to UFCW Canada as a result of our union’s efforts in Canada to raise awareness and funds for sickle cell research, screening programs, and treatments. Throughout the evening, the Minority Coalition raised money for Faces of Our Children, a project that provides funding for sickle cell anaemia research. The UFCW Minority Coalition serves as a unified voice aimed at promoting diversity and inclusion within the North American labour movement. UFCW Canada is one of several Minority Coalition partners, along with the Coalition of Black Trade Unionists (CBTU), the UFCW International Union, the National Association for the Advancement of Coloured People (NAACP), the Southern Christian Leadership Conference, the UFCW United Latinos, the UFCW Women's Network, and Faces of Our Children.